Re: S300V4 / Antey 2500 for Iraq? MOSCOW, February 24. /TASS/. 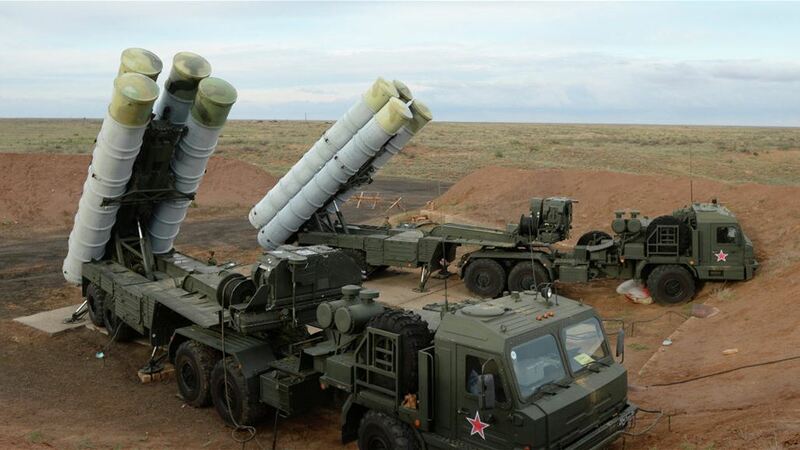 Iraq seeks to acquire S-400 Triumph anti-aircraft weapon systems to defend its territory from air strikes, Iraqi MP Hakim Al-Zamili, head of the Iraqi parliament’s security and defense committee, told Al-Ghad Press daily on Saturday. "Iraq has the right to own cutting-edge weapons to defend its territory and air space from air attacks," he said. "Terrorism targets our country abundant in places sacred for every Iraqi. There are signs and warnings that extremists might use aircraft for attacks on those shrines, which cause lots of worries and anxiety in the country, as it was after an attack on Samarra’s holy places." Samarra, an ancient city in northern Iraq, is home to some Shi’ite holiest shrines. Among them is the al-Askari mosque, regarded as a pilgrimage site for the Shi’ites. On 22 February 2006, its famous golden dome collapsed after a blast burying more than 80 worshippers under debris. The shrine’s destruction plunged Iraq into an unprecedented wave of violence and the country found itself on the brink of a civil war. "America is a developed country, not less than any other. However, the World Trade Center was attacked by planes," al-Zamili noted. "So Iraq intends to possess such a system as S-400 to defend the land, shrines and air space. We are serious about that." Along with this, the MP pointed out that the United States "is unwilling to equip Iraq with arms and to supply it with systems that will ensure comprehensive protection in its territory and air space," but wants Iraq "to be an open arena for realization of [US] plans." "That is why, Iraq needs to have own [anti-aircraft] systems," he added. "It is our right to obtain them." On Wednesday, the Shafaq News website said that an Iraqi delegation would visit Moscow in the near future for negotiating purchases of S-400 anti-aircraft weapon systems. In October 2012, Moscow and Baghdad signed a contract for the supply of 48 air defense systems Pantsir-S and 36 helicopter gunships Mi-28 $4.2 billion worth. The details of the agreement were eventually changed several times as influence of the Islamic State terrorist group grew for a while in Iraq. The S-400 Triumf (NATO’s reporting name SA-21 Growler) is a Russian air defense system of long and intermediate range. It is meant for destroying all current or future aerospace means of attack. It is capable of hitting aerodynamic targets 400 kilometers to 60 kilometers away - tactical ballistic missiles flying at a speed up to 4.8 kilometers per second: cruise missiles, tactical and strategic aircraft and warheads of ballistic missiles. Re: S-400 / S300V4 / Antey 2500 for Iraq? he Iraqi MP who heads the country's security and defense committee, Hakim Al Zamili, has been quoted as making the case for Baghdad to pursue a modern integrated air defense and surface to air missile system—namely Russia's much touted S-400 system. in an interview with the chief of staff of the armed forces othman al ghanimi. Iraq sent a team to study the S-400 system in Russia 9 months ago. However we did not order the system at the time due to both the very high cost and the long delivery timelines. Nevertheless the US does not prevent us from ordering any system we need. honestly looks like the iraqis are fishing around to get a deal. I'm sure they're looking at FD-2000 S-400 and maybe ASTER-30... whoever offers them a long finance deal will get a contract. I'm not sure if nothing new? Iraq and the United States are arguing about the purchase of Russian S-400s. Following Washington's warnings, the Iraqi ambassador in Russia made it clear that Iraq could exercise its sovereignty in making any decision, including on the purchase of Russian S-400 missile systems. Haydar Mansour Hadi, the Iraqi ambassador in Moscow, told Sputnik in an interview that Baghdad can resolve this issue with Washington in diplomatic negotiations. At the same time, he noted that Iraq has the right to take a final decision on this issue for the protection of its people. Hadi also stressed that Baghdad maintains good relations with Washington, and the purchase of S-400 systems should not be interpreted as distancing from the US for establishing closer ties with Russia. after seeing the chinese talk so confidently about their finance / loan offers at the baghdad defence and security expo, my strongest suspicion is that Iraq is getting FD-2000 and maybe the LY-60 for medium range work. يبدو ان التهديدات الاسرائيلة الاخيرة بضرب عدد من الفصائل المسلحة المنضوية تحت لواء الحشد الشعبي بحجة قربها من ايران، باتت تؤخذ على محمل الجد من قبل قادة في الجيش العراقي، الذين باتوا يعدون الخطط الدفاعية لردع تلك الهجمات المتوقعة. تقرير نشرته صحيفة "العربي الجديد"، كشف ايضا عن ان اولئك القادة باتوا يضغطون على الحكومة لتضمين خطط تطوير الجيش العراقي خلال العامين الفين وتسعة عشر والفين وعشرين، منظومات دفاع جوي حديثة ورادارات وأجهزة إستشعار وصواريخ متطورة تغطي الأجواء العراقية بشكل كامل وتمنع أي خرق لأجوائه لمواجهة تلك التهديدات. ضابط رفيع المستوى نقلت عنه الصحيفة تأكيد ذلك، حيث اوضح ايضا أن موازنة الجيش العراقي وخاصة بعد توقف الإنفاق الحربي على المعارك إثر كسر تنظيم داعش، باتت تكفي لشراء منظومة أس 400 الروسية ومنظومات أخرى من موسكو ومن دول أخرى مثل الصين ودول الاتحاد الأوروبي في حال لم توافق الولايات المتحدة على شراء منظومات الباتريوت منها أو ماطلت بذلك. هذا الملف، يرى فيه القائد العسكري، انه بات من الأمور الحرجة التي يجب على العراق التعامل معها في ظل سباق تسليح عالٍ من قبل جيران العراق ك‍تركيا وإيران والسعودية وتهديدات اسرائيلية متكررة تتناقلها وسائل إعلام حول ضربهم مناطق داخل العراق، مشيرا الى ان العراق يسعى أيضا لامتلاك صواريخ بعيدة المدى، وهو من ضمن مكملات حماية سيادته ومنع أي اعتداء مستقبلي عليه". الجانب الروسي، بدوره أبدى موافقة مبدئية على تزويد العراق بمنظومة الدفاع الجوي الأحدث لديه أس 400، وفقا لتلك المصادر، والتي تحدثت ايضا عن وجود دعم إيراني في مساعدة العراق على تطوير سلاح الدفاع الجوي لديه. كشفت صحيفة خليجية، ان العراق يسعى الى تطوير منظمة الدفاع الجوي التابعة له، مبينا ان ذلك جاء بعد تهديدات صهيونية لاستهداف مواقع في البلاد. ونقلت الصحيفة عن ضابط عسكري قوله ان "العراق يسعى الى استكمال بناء كافة المفاصل المهمة بالجيش العراقي، وأهمها بناء منظومة دفاع جوي حديثة تغطي الأجواء العراقية بشكل كامل وتمنع أي خرق لأجوائه"، مؤكدا أن "ذلك جاء بعد الاستشعار بتهديدات من الاحتلال الصهيوني بضربات مواقع في العراق". واضاف ان "العراق يسعى أيضا لامتلاك صواريخ بعيدة المدى أيضا، وهو من ضمن مكملات حماية سيادته ومنع أي اعتداء مستقبلي عليه"، لافتا الى ان "العراق اليوم يختلف عن السابق ولا أعداء لديه سوى الاحتلال الإسرائيلي". واعلنت شركة روس أوبورون أكسبورت الروسية المتخصصة بتصدير الأسلحة ان العراق وقع عقوداً لشراء منظومات بانتسير- إس1 للدفاع الجوي وطائرات مروحية من طرازي مي-28 أن و مي-35 إم وصنف آخر من العتاد الجوي، مبينة أن روسيا تسلّم العراق هذا العتاد وفقا لجدول زمني مقرر، ولا يتوقع أي تعثر في تسليم العراق ما تعاقد على شرائه.